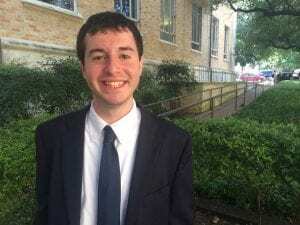 Additionally, Birenbaum credits the Business Honors Program and his extracurricular activities with helping to prepare him for his internship. “BHP gave me a lot of the background knowledge I needed to perform my job. While every company has a different way of doing things and a different culture, it helps to have that strong business sense built up though BHP classes to ensure I’m never completely out of my comfort zone. For my job specifically, that background helped me understand the intricacies of a valuation target and how I can accurately reflect those details in my models,” says Birenbaum. “There are two major extracurriculars where I focus my time are Undergraduate Business Council and the UT Student Government Supreme Court. These organizations have helped me understand how I should logically approach problems, breaking them down in ways that make the overall problem easier to tackle. This entry was posted in Student Profiles and tagged Aaron Birenbaum. Bookmark the permalink.